When Bengal was partitioned, it sparked an outburst of public anger against the British. In 1908 two Bengali youths, Prafulla Chaki and Khudiram Bose who were part of Jugantar, threw a bomb on a carriage at Muzzafarpur in order to kill the Chief Presidency Magistrate Douglas Kingsford of Calcutta fame, but erroneously killed some women travelling in it. This incident is known to be the Alipore bomb case. While Chaki committed suicide when caught, Bose was hanged. Tilak in his paper Kesari defended the revolutionaries and called for immediate Swaraj or Self-rule. Tilak was arrested for sedation and imprisoned for around five years, till 1914. "I believe that a nation held down by foreign bayonets is in a perpetual state of war. Since open battle is rendered impossible to a disarmed race, I attacked by surprise. Since guns were denied to me I drew forth my pistol and fired. Poor in wealth and intellect, a son like myself has nothing else to offer to the mother but his own blood. And so I have sacrificed the same on her altar. The only lesson required in India at present is to learn how to die, and the only way to teach it is by dying ourselves. My only prayer to God is that I may be re-born of the same mother and I may re-die in the same sacred cause till the cause is successful. Vande Mataram!" Bagha Jatin (1879–1915) was the principal leader of the Jugantar party that was the central association of revolutionaries in Bengal. He was arrested, along with several other leaders, in connection with the Howrah conspiracy case. Having personally met the German Crown-Prince in Calcutta shortly before World War I, he obtained the promise of arms and ammunition from Germany; as such, he was responsible for the planned German Plot during World War I. He was seriosly wounded and died in a gunfire as the aftermath of German conspiracy in 1915. Ram Prasad Bismil (1897 – 1927) was an Indian revolutionary from Uttar Pradesh who participated in Mainpuri Conspiracy of 1918 and the Kakori conspiracy case of 1925. He was associated with Arya Samaj, where he got inspiration from Satyarth Prakash, a book written by Swami Dayanand Saraswati. Bismil was one of the founder members of the Hindustan Republican Association, a historical revolutionary organisation known for its ideology and constitution. According to Bhagat Singh he was a great poet-writer of Urdu and Hindi, who had also translated the books Catherine from English and Bolshevikon Ki Kartoot from Bangla. The famous poem "Sarfaroshi ki Tamanna" is also popularly attributed to him, although some progressive writers have remarked that 'Bismil' Azimabadi actually wrote the poem and Ram Prasad Bismil immortalized it. In 1918 Bismil published a pamphlet titled "Deshvasiyon Ke Nam Sandesh" (A Message to Countrymen) and distributed it amongst public along with his poem "Mainpuri Ki Pratigya". Along with Pt. Genda Lal Dixit, he participated in Manipuri Conspiracy against the British King Emperor. In 1925 Bismil executed a meticulous plan for looting the government treasury carried in a train at Kakori, near Lucknow in U.P. Ten revolutionaries under the leadership of Bismil stopped the 8 Down Saharanpur-Lucknow passenger train and looted the treasury. Along with Ram Prasad Bismil, Ashfaqulla Khan, Thakur Roshan Singh and Rajendra Nath Lahiri were sentenced to death in this case. India House was an informal Indian nationalist organisation based in London between 1905 and 1910. Initially it was known as the Indian Home Rule Society (IHRS). This was founded by Shyamji Krishna Varma along with other notable expatriate Indians such as Madam Bhikaji Cama, S.R. Rana and Lala Lajpat Rai. Krishna Varma used his considerable financial resources to offer scholarships to Indian students in memory of leaders of the 1857 uprising on the condition that the recipients would not accept any paid post or honorary office from The Raj upon their return to India. It was one among the most prominent centres for revolutionary Indian nationalism outside India.A number of prominent Indian revolutionaries and nationalists were associated with India House, most famously Vinayak Damodar Savarkar, V.N. Chatterjee (Chatto), Lala Har Dayal, V. V. S. Aiyar, M.P.T. Acharya and Senapati Bapat. 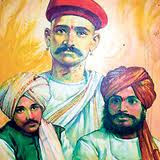 They are known to be as the founding fathers of Indian communism and Hindu nationalism. They published an anti-colonialist newspaper, The Indian Sociologist, which the British Raj banned as "seditious". In 1909, a member of India House Madan Lal Dhingra assassinated Sir W.H. Curzon Wyllie. Under the light of subsequent investigations by Scotland Yard and the Indian Political Intelligence Office, the organisation fell into decline and many of its members, including Shyamji Krishna Varma and Bhikaji Cama, left Britain for Continental Europe, where they continued their activities. Some students, including Har Dayal, moved to the United States. The network created by India House played a key part in the Hindu-German Conspiracy for nationalist revolution in India during World War I. The Paris Indian Society, a branch of the IHRS, was also launched in 1905 under the patronage of Madam Cama, Sardar Singh Rana and B.H. Godrej.A number of India House members who later rose to prominence—including V.N. Chatterjee, Har Dayal and Acharya and others—first encountered the IHRS through the Paris Indian Society.